Educational technology is a catchphrase on the tongues of many educators of the digital age. It is a conglomerate term that suggests an updated teaching pedagogy, a transition to a student centered classroom and a combination of tools that are meant to facilitate learning. Technology alone cannot fix a broken lesson. Advanced computer-aided technology may however inspire a revolution in education that is situated in an authentic context and promotes the tenets of distributed cognition. The walls of our future classrooms are coming down and in their place a global collective intelligence will surmount. What is the future of educational technology? To answer this, you must begin with the past. 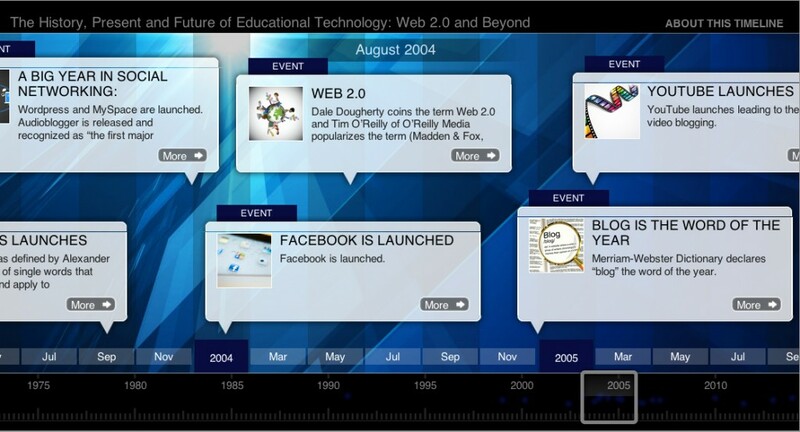 Please follow this path to view a timeline documenting the history, present and future of educational technology. All references used in the creation of this timeline are located in the timeline, located in the final entry currently dated January 01, 2014. This entry was posted in Commentary 3 and tagged digital literacy, Future, multiliteracies, technology, web 2.0. Bookmark the permalink. I love that timeline – what an awesome project catching all the relevant and groundbreaking moves. I want to try this program with my students – it really is a great way to document with text and picture! I had a lot of fun making the timeline and I’m going to add to it throughout my MET journey. I think it will be much more comprehensive when it appears in my final portfolio. Wow! Your timeline itself is an example of one a brilliant web 2.0 tool and how such technologies can transform educational spaces. What is the actual website/program you have used to create this? As for your content – you have done a great job of highlighting social media and its emergence in our society. I wonder though, why you chose to start your timeline documenting educational technology from the 1960s? It seems more apt that your timeline is one that shows the history of the social currents of educational technology. Perhaps it would be more comprehensive and included all educational technologies if we looked more broadly – perhaps even to the point of including Logo etc. All in all, an excellent presentation! I found the comment Alexander made about computer networking being invented in the 1960s to be very interesting. Considering that JCR Licklider created social networking before the internet was invented is an amazing discovery. I agree that my timeline can be more comprehensive, and I plan to add to it. For this project I had to adhere to the total word length of no more than 1000 words for a commentary. I used “tiki-toki” to create this. I really enjoyed your presentation! I found it interesting that whenever a technology started to become popular, it was acquired by a behemoth such as Yahoo or Google. I suppose it’s consistent with the consolidation we have witnessed in many other sectors in the last ten years. The 2011 entry on your timeline that indicate that more than 3/4 of Internet users blog is a great example of the growing popularity of the active involvement by users and the blurring of the roles of author and reader. As I was considering my challenge question, “what educational technology will survive in five years?” I kept coming back to Google and Yahoo. I had no idea that successful Web 2.0 applications are essentially owned and operated by a monopoly. I wonder if the goal of many internet startups is to be bought out by Google or Yahoo? Interesting Timeline, I’m going to bookmark the tool and perhaps use it in the future. It is innovative and creative but my only hesitation in using a timeline would be where to synthesize the information or ideas. You could synthesize the information in each entry or in the introduction, or both as I have done from time to time. I wrote each entry separately as a stand alone paragraph before pasting the information into the timeline software. Each entry can be as long or as short as you like, especially if you are being creative and have no length restrictions. First off I wanted to say, great project! It is helpful when thinking about the evolution of technologies to consider their linear placement in time. Despite the multi-modal avenues of thinking, writing, and speaking that we’ve been pondering this term, time remains one of the things that is still largely a linear progression. Your project has encapsulated that and your quote “Technology alone cannot fix a broken lesson” is one that it’s very important for all of us to remember. Take care and hope to work with you in the future. The screencap came to me after I originally posted a link. I just didn’t like the look of a text link. What an impressive project! I really enjoyed going through your timeline. What a good idea you had! I have never used that tool. I will keep it for a try.